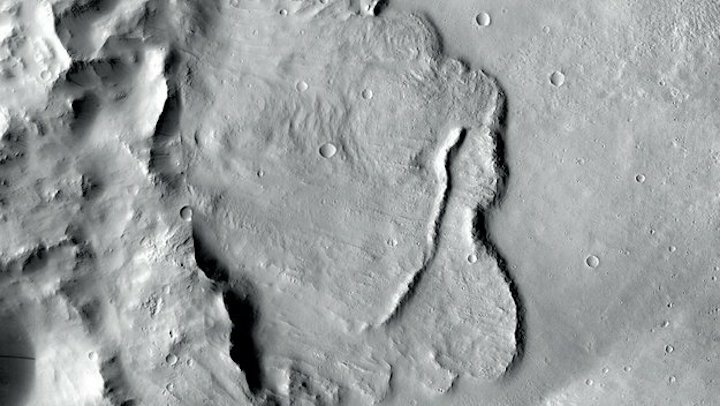 Salese and colleagues explored 24 deep, enclosed craters in the northern hemisphere of Mars, with floors lying roughly 4000 m below martian ‘sea level’ (a level that, given the planet’s lack of seas, is arbitrarily defined on Mars based on elevation and atmospheric pressure). They found features on the floors of these craters that could only have formed in the presence of water. Many craters contain multiple features, all at depths of 4000 to 4500 m – indicating that these craters once contained pools and flows of water that changed and receded over time. 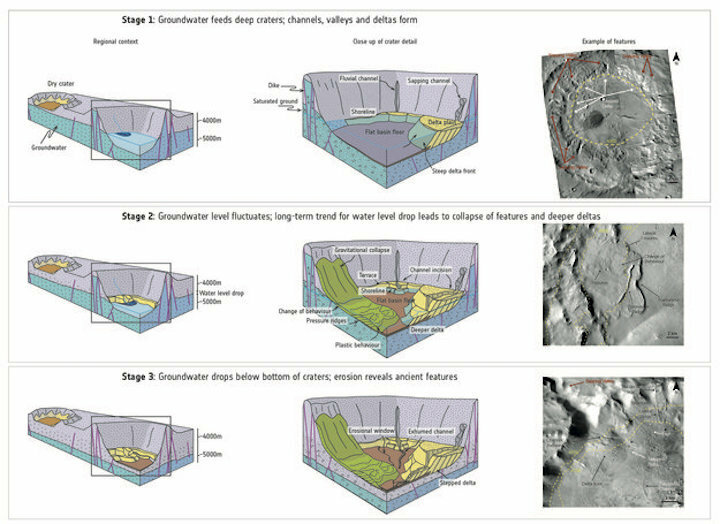 Features include channels etched into crater walls, valleys carved out by sapping groundwater, dark, curved deltas thought to have formed as water levels rose and fell, ridged terraces within crater walls formed by standing water, and fan-shaped deposits of sediment associated with flowing water. The water level aligns with the proposed shorelines of a putative martian ocean thought to have existed on Mars between three and four billion years ago. “We think that this ocean may have connected to a system of underground lakes that spread across the entire planet,” adds co-author Gian Gabriele Ori, director of the Università D’Annunzio’s International Research School of Planetary Sciences, Italy. The history of water on Mars is a complex one, and is intricately linked to understanding whether or not life ever arose there – and, if so, where, when, and how it did so. The team also spotted signs of minerals within five of the craters that are linked to the emergence of life on Earth: various clays, carbonates, and silicates. The finding adds weight to the idea that these basins on Mars may once have had the ingredients to host life. 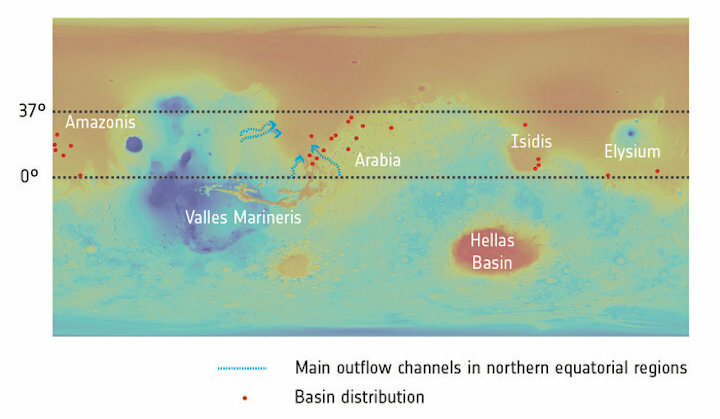 Moreover, they were the only basins deep enough to intersect with the water-saturated part of Mars’ crust for long periods of time, with evidence perhaps still buried in the sediments today. Exploring sites like these may thus reveal the conditions suitable for past life, and are therefore highly relevant to astrobiological missions such as ExoMars – a joint ESA and Roscosmos endeavour. 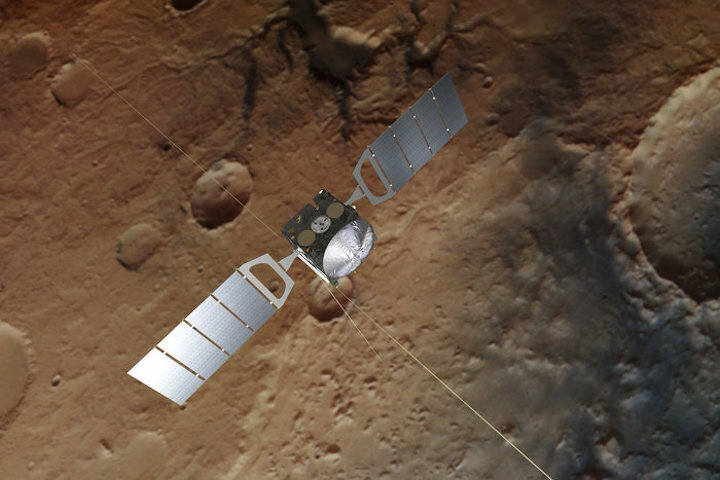 While the ExoMars Trace Gas Orbiter is already studying Mars from above, the next mission will launch next year. It comprises a rover – recently named after Rosalind Franklin – and a surface science platform, and will target and explore martian sites thought to be key in the hunt for signs of life on Mars. “Findings like this are hugely important; they help us to identify the regions of Mars that are the most promising for finding signs of past life,” says Dmitri Titov, ESA’s Mars Express project scientist.